Call to Artists The Limner Gallery in Hudson, NY is currently accepting entries for their exhibition, A Show of Heads, which will be on view October 18 – November 10, 2018. Open to all artists, national and international, working in any media. Entry is open to all interpretations and portrayals of the human head. All visions of the head, including partial and multiple heads, figurative and conceptual – will be reviewed and considered. Learn more. Playwrights Each year American Blues Theater accepts worldwide submissions of original, unpublished full-length plays for the Blue Ink Playwriting Contest. The winning play will be selected by Artistic Director Gwendolyn Whiteside and the theater’s Ensemble. The playwright receives a monetary prize of $1,000 and a developmental workshop or staged reading at American Blues Theater in Chicago. Cash prizes are awarded to finalists and semi-finalists too. All proceeds of the administrative fee are distributed for playwrights’ cash prizes. Playwrights may only submit one (1) manuscript each year for consideration. Semi-finalists, finalists, and the award winner will be notified January – March 2019. Learn more. Emerging Photographer Scholarship The John Chervinsky Emerging Photographer Scholarship seeks to recognize, encourage and reward photographers with the potential to create a body of work and sustain solo exhibitions. Awarded annually, the Scholarship provides recipients with a monetary award of $3,000, exhibition of their work at the Griffin Museum of Photography, and a volume from John’s personal library of photography books. Learn more. Session Proposals for Writers Conference Want to teach a session at GrubStreet’s 2019 Muse and the Marketplace Conference? Writers, authors, literary agents, editors, and publishing experts are encouraged to apply to the conference as a Teaching Scholar. The conference is seeking innovative, rigorous, and fascinating sessions on topics of the “Muse” (the craft of fiction and/or nonfiction) and the “Marketplace” (elements of publishing). Teaching Scholars enjoy free access to all conference sessions, keynotes, and special events. Learn more. Monotypes Entries are currently being accepted by the Monotype Guild of New England for their Open Members’ Exhibition: Pressing Matters, September 28 – November 2, 2018 at LynnArts, 25 Exchange Street, Lynn, MA. The Monotype Guild of New England invites members in good standing to submit ONE 2-D monotype or monoprint for an exhibition at LynnArts. Learn more. Public Artists The city of Boston has announced a call for public art at the new Roxbury fire station. They are looking for your ideas and proposals on how they can incorporate public art at Engine 42. This public art project has a budget of $300,000 and is for a site-specific project. The art is to be located on the exterior of the building or its grounds, and the design should enrich the connection between the Boston Fire Department and the rich and diverse surrounding Egleston and Roxbury communities. Learn more. Call to Artists Saugus Action Volunteers for the Environment (SAVE) is seeking submissions for its first annual “ACEC Rumney Marsh” exhibition, to be held September 22-29 at the Marleah Elizabeth Graves (MEG) Center in Saugus, MA. All artists 18 years of age and older who meet the specifications for submissions may exhibit one piece. Rumney Marsh must be the focus of the art. Gift cards or art supplies will be awarded to six artists. There is no entry fee. Learn more. Drop off: September 21, 2018, from 5:30-7:30 pm. Muralists The Franklin Cultural District is looking for artists to create a couple murals in their cultural district to liven up some their buildings. Learn more. Exhibition Proposals The Friends of the Jamaica Plain Branch Library are gearing up for a new round of submissions to select the exhibitions for 2019 season. The Friends welcome artists from across New England to submit recent two-dimensional work for a solo or group show, each lasting for two-month periods. There is no specific theme, but artists are encouraged to include work that can be enjoyed by the diverse visitorship of the JP Branch Library, including children, teens, and other community members. The following art mediums will be considered for selection of five (5) solo shows in Drawing, Mixed Media/Collage, Painting, Photography, and Printmaking and one (1) themed group show (mix of mediums welcome). Accepted work will be displayed in a public area of the JP Branch Library, and an accompanying reception will be organized by Uforge, on behalf of the Friends. Submission is free. Learn more. Filmmakers The Cultural Center of Cape Cod invites filmmakers worldwide to submit video for exhibition their our Vault Gallery for Moving Pictures. Three chosen films will run on a continuous loop throughout the duration of the exhibit from October 30-November 11, 2018. The Cultural Center directors will jury. Open theme. Work to represent the moving image as an art form, no matter what the genre. Video-art works, short movies, digital and animation films, are all welcome for submission. Films to run no longer than 20 minutes in length. Foreign entries should have English subtitles. Learn more. 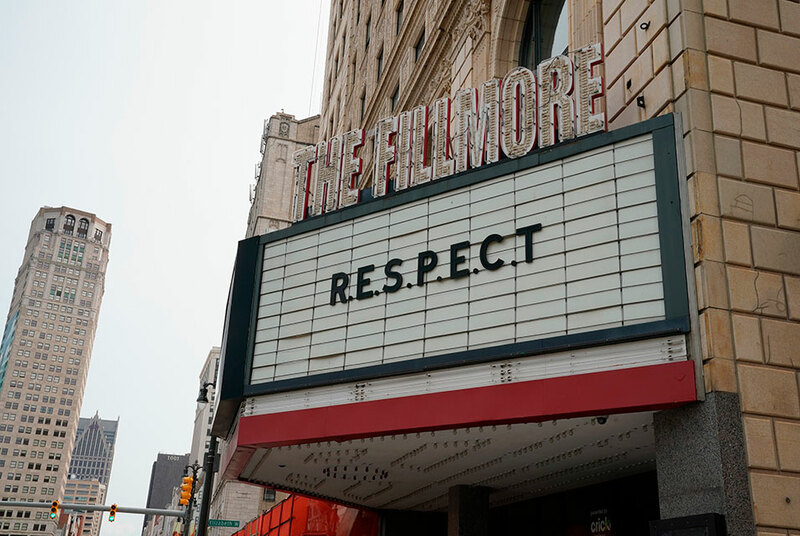 Image: The Fillmore in Downtown Detroit pays its respects to the late Aretha Franklin with the tittle of one of her songs in Detroit, Michigan on August 18, 2018. TIMOTHY A. CLARY / AFP.